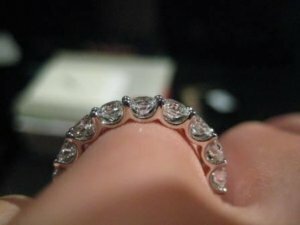 Reset my 35 pointer eternity band? Discussion in 'RockyTalky' started by dwj6211, Jan 7, 2019. I’m a guy who wears an eternity band... yes LOL. Anyway... I am looking for some opinions/advice. I am contemplating resetting it—currently it’s 18-35 pointers, a little over 6 carats total. Currently it’s in a shared u prong minimal setting. I find it to be slightly uncomfortable all of a sudden. Anyone have one of these in a similar size to mine they can share? Sorry no help at all, just stopping by to say how gorgeous that first ring is. I have an 18 x 0. 33 ct eternity in a normal u setting. It's less swoopy than yours and I much prefer that design . Sorry your ring got uncomfortable suddenly. I hope you find a comfortable yet beautiful solution. Keep wearing those sparklies!!!! Can you post a picture of what you have so we can maybe see what it is that is bothering you? Might help us to be able to make suggestions. Edit...post the picture from your avatar (if that's the ring). It already looks to be set very low. +1 I LOVE to see men wearing diamonds! Good luck on your re-set. Matthews1127, kgizo, rockysalamander and 2 others like this. In theory, the diamonds could be set so low that the little sharp culets dig into the skin ( a different kind of discomfort!) - which might turn serious if the ring gets pressed hard against the finger (perhaps accidentally). Each jeweler is likely to give you at least somewhat different options with this. Can you also describe the discomfort? What part of which fingers? Have you recently gain or lost weight? Any fluid retention or new finger puffiness? Does the ring feel scratchy or squeezy? This may not suit, but I remembered this ring and wondered if it might work. My mom has a band like this in her rotating stable of ring and finds it quite comfy. You could use your existing stones in the middle channel and add stones for the side bead-set stones. 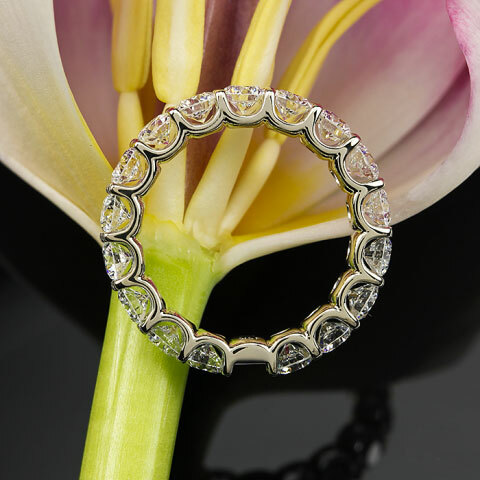 You can also have this made as three rings you stack. Matthews1127 and kipari like this. Sorry for the late reply! Has been a crazy week at work. Here is my ring. To further answer some questions that had been posted. Yes, I have gained a few pounds lol. Nothing huge though. I wear it on my left ring finger. It is set very low with minimal metal, as that was my desire when I was having it made. And here is one of it on my hand. star-fish, Tekate and Matthews1127 like this. So, as people age, change work with their hands, or gain/lose weight -- it impacts the finger shape. I can see the ring it too tight in this screen-shot. But, my guess is that you have also had a finger shape change. The base of your fingers are wider than the knuckle (red circles). Even when I'm quite svelte, my fingers are like this and make rings that are tall off my fingers uncomfortable. The ring I posted above with the stone channel set or bead set may help, but it may also just be that you are no longer comfy with such a tall setting. Matthews1127, dwj6211 and kipari like this. Matthews1127 and dwj6211 like this. Thanks for the advice! I’m not terribly fond of the channel set look. Or a trellis or an airline setting would be any more comfy? Any of the settings may be more comfy or not...it will be the execution of the setting that matters. Though, generally, trellis settings are not particularly low or there is no room for the trellis detail. I would reach out to the maker you like (I'd go with Victor Canera for hand-forged or David Klass for cast) and ask them if they have a prong setting that would set them lower than you present setting. A U-shaped setting can be pretty low. You might also look at shared-prong setting (less prongs to be scratchy). I also like the U-prong (sans pave). Once you mail your setting to your selected maker, they can tell you if the stones can be lowered enough to feel the difference. You might also consider a "black" spot to allow future sizing changes (see WF below). Matthews1127 and Krisking like this. You can also ask them to cheat a bit in the setting. They can drill a hole through the solid bottom in a U--prong style to get the stones even a bit lower. where there is a gap that you can use to help grown/shrink the setting. more stones. I think you are going to have to reach out to whomever you want to do the setting and ask them for suggestions. The height of the stones will determine how low they can be set. It doesn't look like the LM examples are particularly low. But best ask him how high off the finger this ring is. Mine is a U prong and I find it very comfortable. I have had it shaved down on the inside, instead of having it sized. I wanted to be able to wear it on my middle finger and it wasn't worth the cost of remaking to me personally . For many PSers this would NOT be mind clean. But since you're considering a remake anyways, maybe look into the option of taking off metal from the inside if possible. Measure height off your finger before and after. It's going to be looser and not as far off the finger. If it is comfortable to wear again, you'll know what dimensions you need in your new ring. Seconding @rockysalamander s trick with the holes in the uprong design. Matthews1127 and rockysalamander like this. Sure! Here you go! I can take more as soon as I get home. I also have photos of the diamonds when they were loose as well before they were set. we understand that its the size of your current setting that is bothering you. bother you...that could be taking a chance). (LM or VC) and let them know your requirements then you should be able to get a low set ring that fits you better. I'm with @tyty333 in that I don't see how your ring can be made lower by any demonstrable amount. A good maker might be able to get it a tiny bit lower, but like tyty said, making it bigger will raise it back up. I think you'll need to consult with a maker and see if they see ideas we can't in the photos. Would you even consider a band made of a different diamond cut like ECs, french cuts, ovals, or marquise if you want to stay with an eternity style? The only other cut I’d consider is 50 pointer emerald cut lmao.